The Elvis 6 Server Release Notes contain information about the new features, changes, fixed issues, known issues and upgrade instructions for each release of Elvis Server version 6. Support for adding a Collection to another Collection has now been added to the Pro client. 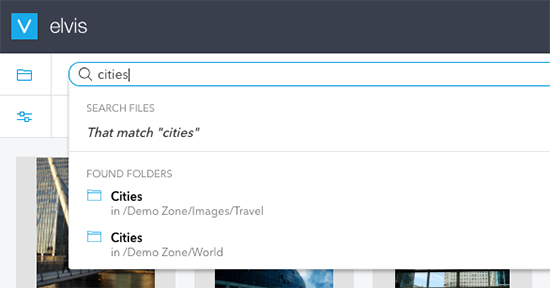 This makes it possible to organize content more structurally, similar to a folder structure. Using Collections in Collections is typically used in an environment in which the original files are archived as read-only files. Files are then added to a Collection structure similar to organizing folders, after which the files are copied over as editable files to the production environment. For more information, see Changing the look and feel of the Pro client in Elvis 6. For more information, see Keyboard shortcuts for the Pro client of Elvis 6. When a layout is opened that contains files that are stored in Elvis, a link is automatically established between the files in Elvis and their placed instances on the layout. Based on the Elvis ID in the InDesign link or file. Based on the 'Contained' relation in Elvis (based on the XMP instance ID). Based on the 'Referenced by' relation in Elvis (based on the XMP instance ID). Based on the file name. This can be a file in the same folder, the Links folder, or anywhere else. A layout is opened that contains a JPG image that is stored in Elvis. The image has Elvis ID '123' which is stored in the XMP data of the image as well as in the link in the layout. The image is opened for editing and saved locally as a Photoshop file (or any other file type that supports XMP, including JPG). This new image still has Elvis ID '123' stored in its XMP data. The JPG image on the layout is replaced by the Photoshop file. The Photoshop file is uploaded to Elvis as a new asset (and is assigned a new Elvis ID, for example '456'). The next time the layout is opened, the Elvis plug-in will search for the file using the Elvis ID in the link of the layout which in this case this ID is '123'. It will therefore find the file in Elvis (see the list earlier in this article describing the order in which the file is located), and this file will be the previous version of the image and not the new version with ID '456'. By enabling the option 'Relink Files Based on Their File Name Only', the linking process ignores the Elvis ID (steps 1 – 3 in the list earlier in this article) and uses the file name instead. 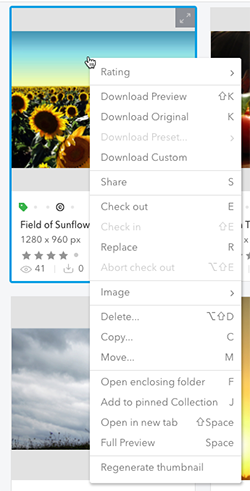 Note: When after step 2 the Photoshop file is first uploaded to Elvis and subsequently placed from Elvis onto the layout, a link is created that does have the correct ID. The scenario described above applies specifically to a situation where the edited file is stored to and placed from the local system. For more information, see Using Elvis 6 with Adobe InDesign – Opening layouts. Oracle: Elvis Server now uses OpenJDK instead of Oracle Java SE 8. Because of the licensing changes that Oracle is implementing for Oracle Java SE 8, we have changed to OpenJDK for Elvis Server. LVS-13080 Pro client/metadata: Add spinner to metadata fields to indicate that the metadata is being saved. LVS-13328 Sharing/uploading: Enable the Finish button only when all required metadata is entered. LVS-13401 Pro client/navigation: Folder browser does not show the full tree when pressing the Back button on the Checked-out Files page. LVS-13406 Pro client/searching: Searching using terms with a special character results in an exception. LVS-13437 Pro client/downloading: Prevent web browser cache from downloading the previous version of the asset. LVS-13440 Pro client/uploading: "Select all" keyboard shortcut does not work. LVS-13447 Pro client/checking-in: Disable the Check-in button when a check-in is already triggered for an asset. LVS-13484 plugin/folder import: Folder import file settleTime is not respected when the hot folder is on an NFS share. LVS-13502 Pro client/moving: The Move button is disabled when a folder is moved to a structure with a similar path. LVS-13513 Brand portal/plug-in: The 'Plugins' menu is not visible when navigating to the Brand portal. LVS-13516 Pro client/downloading: The 'Download preset' option is disabled for a Collection or for any image in the Linked Items panel. LVS-13529 Pro client/keyboard shortcuts: Pressing the 'Menu' key will result in a random asset to be selected. LVS-13538 Server: Switch to OpenJDK 8. LVS-13554 Pro client/navigation: The incorrect tooltip is shown for toggling the Folder Browser. LVS-13383 Previewing/PDF: Add 'PDF preview' for Microsoft Office documents to fullscreen preview. LVS-13417 Pro client/Collections: Add an indicator when dragging Collections to show where a Collection can and cannot be dropped. SPA-1877 Add support for adding Collections to Collections. No known issues exist in this release of Elvis. Clean installation: For information about installing Elvis 6 Server on a system on which Elvis 6 Server is not yet installed, see Installing Elvis 6 Server. Upgrading an existing installation. For information about upgrading an existing installation of Elvis 6 Server, see Upgrading Elvis 6. Upgrade from Elvis 5: For information about upgrading Elvis 5 to Elvis 6, see Upgrading Elvis 5 to Elvis 6. Migration from Elvis 4: For information about migrating Elvis 4 to Elvis 6, see Migrating Elvis 4 to Elvis 6. No changes have been made in this release of Elvis. LVS-9965 Pro client: All date fields should work the same. LVS-12488 Admin/support tools: Add dashes to the file name of the downloaded ZIP file containing log files. LVS-11803 Server/configuration: Changes to logging.properties.txt file should be applied without requiring a restart. LVS-13143 Management Console: Unable to select or copy text when using Chrome. LVS-13178 processing/TIFF: Preview not generated when TIFF file contains IFD0 position metadata. LVS-13247 Pro client: Un-edited asset is incorrectly shown as edited after reconnecting Elvis Agent. LVS-13299 Pro client: When selecting less than 1000 assets, message appears stating that selection cannot be made because more than 1000 assets are present. LVS-13355 Pro client: When selecting all assets and then deselecting one asset, less assets are selected than expected. LVS-13374 Pro client: 'Select all' action only selects the first 400 assets. LVS-13394 Pro client: When checking-out an asset in the Linked panel, the panel shows the linked assets of the checked-out asset instead of the originally selected asset. LVS-13404 Pro client: Query entered in the Search box disappears when refreshing the page. LVS-13407 Pro client: Incorrect handling of a hash and semicolon character for the asset name in Metadata panel. LVS-13419 Migration: Automatically retry uploads to S3 up to three times. LVS-13436 Pro client: Buttons in 'Move' and 'Copy' dialogs are enabled while no target folder is selected. LVS-13438 Pro client: Folder not shown in 'Move' dialog when it is positioned below more than 5 Collections. LVS-13440 Pro client/uploading: 'Select all' keyboard shortcut does not work on the Upload page. LVS-13442 Pro client: Options in 'More actions' menu are sometimes hidden from view. LVS-13443 Elvis Agent/InDesign plug-in: Changes to the layout are discarded by the InDesign plug-in when Elvis Agent reconnects. LVS-13451 Server/storage: Support the reset of input streams when large S3 uploads are interrupted. LVS-13452 Pro client/flags: flagIcon cannot be used when the dataType setting of the metadata field is set to 'number'. LVS-13453 Installer/MacOS: Error when opening the installer: "There may be a problem with this disk image." LVS-13456 Processing/video: After uploading a .m4a file the extension changes to .mp4. LVS-13464 Pro client: Unexpected behavior when moving assets to the User folder. LVS-13472 Pro client: Incorrect state of Folder browser toggle icon when the 'Copy' or 'Move' dialog is opened. No new features have been added in this release of Elvis. LVS-12577 Pro client/sharing: Add column 'User' in Manage Shared Links. LVS-12724 Server/MacOS: When a serverPath is set, opening the admin page from the Elvis Server panel opens the incorrect URL. LVS-12927 Previewing/PowerPoint: Previewing a PowerPoint document sometimes results in horizontal scrollbar. LVS-13107 Pro client/check-out: When selecting a file on the Checked-out Files page, the options in the toolbar respond slowly. LVS-13161 Elvis Agent/Windows: Improve handling of locked Office files. LVS-13233 Pro client/previewing: Animated GIFs with a transparent background do not play correctly. LVS-13246 Previewing/PDF: PDF Preview displays a single-page PDF across the width of a multi-page PDF. LVS-13264 Pro client/action plug-in: Plug-in does not work when no asset is selected. LVS-13277 Pro client/Collections: ancestorPaths query is shown instead of Collection name when images are uploaded to a new Collection. LVS-13286 Share client/downloading: 'Download failed' error appears when downloading more than 200 assets. LVS-13289 Previewing/Linux: Images with small dimensions sometimes fail to generate a preview. LVS-13290 Server/webhook: Webhook queue fills up when one of the Webhook URLs has no response. LVS-13314 Previewing/EPS: EPS images show smaller on a MacOS server compared to Linux and Windows. LVS-13350 Folder/deleting: The spinning arrow icon in front of a folder is not removed when the process of deleting the folder is cancelled. LVS-13354 Elvis Agent/stability: Handle HTMLresponse codes to prevent accidental check-in of a broken asset. LVS-13368 Pro client/grid: Last row of the grid may have different dimensions for asset thumbnails compared to other rows. LVS-13388 Pro client/navigation: When clicking the Checked-out Files option the selection in the Folder browser is cleared. LVS-13393 Pro client/InDesign: Abort check-out is allowed for InDesign layouts. LVS-13396 Rescue tool: Recover assetPath from stats if possible. LVS-13412 Elvis Agent/stability: 'Not logged in' warning incorrectly shown in Pro client. No changes to the documentation have been made in this release of Elvis. LVS-12736 Pro client: "Checked out by" field is not visible for users that have permissions to view or edit the field. LVS-12918 Server: Upgrade Ghostscript to version 9.26. LVS-12943 Pro client: Scrolling using keyboard in thumbnail view is not smooth. LVS-13138 Elvis agent: When changing assets in batch, not all assets are shown updated on the Checked-out files page. LVS-13214 Server: Elvis Permissions should not be applied to users accessing assets through Enterprise. LVS-13217 Server: Scheduled plug-ins connect to HTTP while redirect from HTTP to HTTPS is enabled, causing the plug-in to fail. LVS-13228 Pro client: Messages missing for parentContainerFolderPaths and parentContainerAncestorPaths metadata fields. LVS-13263 APIs: Response header contain full exception from processing tools, making it difficult to parse the response. LVS-13279 Pro client: Opening plug-ins through the context menu of assets in the Linked items panel provides incorrect context for the plug-in. LVS-13283 Pro client: Able to create a Shared Link through a keyboard shortcut from the Checked-out Files page. LVS-13330 Management Console: Removed Taxonomy Capability from Management Console as it is has no functional implementation client side. Elvis 6.26 contains a new and more robust process for deleting folders. Elvis Server traversed through the folder structure and deleted individual assets and sub folders. For each asset, a check was made to see if a user had permission to delete it. If so, the index entries as well as the original file and renditions from the storage would be removed. For end users, the feedback was not always clear as they would still see the folder when deletion was in progress. Elvis Server first checks if the user has permission to delete all assets in the folder. If not, then the process fails immediately. Elvis Server flags the folder as deleted. This is done instantly. All users that have the folder in view will immediately see that it is being deleted by the grayed-out folder icon that is shown in combination with a progress spinner. While the folder is being deleted, any actions on that folder or its content cannot be performed. This makes sure that users for example upload assets to such a folder or manually start a deletion process for such a folder. The assets and sub folders are deleted in bulk. This reduces processing time, especially for Elasticsearch index operations. Because permissions were already checked on folder level, no security check is done on asset level. This also speeds up the process. When all assets and sub folders are deleted, the folder itself is also deleted and removed from view for the users. If the delete process is interrupted — for example because of an Elvis Server node restart — another node will automatically pick up and finish the process. Note: The Development team is currently working on similar improvements for moving folders. This will be made available in an upcoming release of Elvis. Previews of animated GIFs now keep their original animation. Thumbnails will also animate, but only when users hover their mouse over the thumbnail. Note: This feature requires the user to have permission to use the original asset; when this is not the case a static preview is shown instead. A configuration option has been added for configuring the processing of audio files separately from video files. This makes it possible to generate audio files for playback in preview mode in a higher quality than what is necessary for video previews. The Webhook API now also includes a 'asset_create_from_filestore_rescue' event. It is fired when an index entry is created as part of the Rescue tool. LVS-9518 Processing: Fall back to PixelsPerUnit for PNG files with resolution missing from extracted metadata. LVS-12637 Plug-in/ww_enterprise_import: Prevent repeating execution from stopping in the middle of an archive. LVS-12645 Brand portal: Tag order different from that in the Pro client. LVS-12701 Plug-in/sample: Increase default number of items on the 'Print Contact Sheet' plug-in. LVS-12840 Elvis Agent: Changes made to files while user did not have his Web browser or Agent active are not reflected in the UI. LVS-12895 Processing/MS Office: No previews for Office files on Centos 7. LVS-12910 Management Console: Active Users page displays different number of users connected per node. LVS-12947 Server/operation: Provide direct feedback to users for folders in process of being removed while data is cleaned up in the background. LVS-12976 Processing: Missing GLIBC_2.14 and GLIBC_2.17 on CentOS/RHEL 6. LVS-13102 Pro client: Values in check box filter overlap each other when wrapped to a new line. LVS-13008 Processing: Use values from View Box metadata for SVG assets to improve generated previews. LVS-13132 Preview/audio: Add separate Audio preview quality configuration instead of reusing video configuration. LVS-13135 Plug-in/ww_enterprise_import: Archiving with only 'LayoutPdf' enabled results in a failed Archive response while data is in Elvis. LVS-13144 User preferences: Request for user preferences may be blocked on server causing the client to become unresponsive. LVS-13154 Migration: Handle unexpectedly long folder paths to prevent failure from migrating from Elvis 4.x. LVS-13173 Processing/BMP: Prefer BMP over DIB for image/bmp MIME type. LVS-13177 Pro client: The Clear button of the search bar is shown when previewing a file. LVS-13209 Admin/Rescue tool: Rescue tool does not repair originals that are stored on a different storage engine. SPA-1853 Pro client: Add support for previewing animated GIFs. Because of the structural changes in the removal process of folders, Auto Organized folders are no longer cleaned when removing assets or folders from these folders. Elvis InDesign client: File caching. When working in InDesign with files that are stored in Elvis, these files are sometimes downloaded to the system and stored in a cache folder. In earlier versions of the Elvis InDesign client, these cached files were removed when the layout was closed. However, this meant that when the layout was re-opened that these files needed to be downloaded again. It would therefore be beneficial to keep these files on the system, also because they can then act as a backup when something goes wrong with the original file. 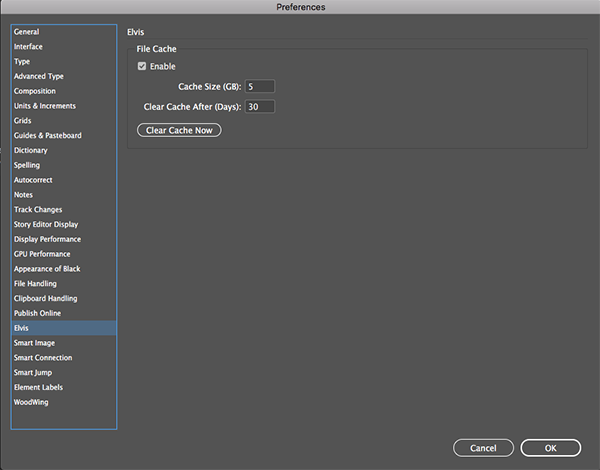 It is now possible to manage cached files by enabling the File Cache option in the new InDesign > Elvis preferences. This also controls the maximum file size of the cache folder and how long the files may stay in the cache folder. When closing a layout, any cached files that are related to that layout are kept in the cache folder. All files are cleared that have been stored longer in the cache folder than the defined time period. When the size of the folder then still exceeds the maximum size, enough files are removed to bring it below this size (the oldest files are removed first). Info: This feature is available for InDesign for Adobe CC 2017, CC 2018, and CC 2019. 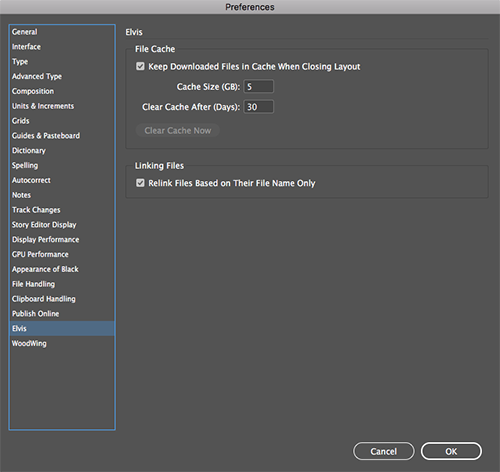 For more information, see Using Elvis 6 with Adobe InDesign – Managing cached files. Pro client: Auto finish file upload for a Share Request. When users add files to a Share Request, an 'Auto finish' option can now be enabled to automatically complete the process. This is useful in situations where it takes a long time to upload files, for example because of large file sizes and/or a high number of files that are uploaded. Pro client: Searching in Collections. It is now possible to include the content of Collections in the search results. This is done by enabling the option 'Show files in Collections' in the Folder browser. This option is especially useful when folders only contain Collections; this way, the content of these Collections can be made visible such as when browsing the folder structure. Updating indexes: The 'Delete orphaned index entries' option has been moved from the Asset Processing tool to the File Rescue tool. LVS-12840 Pro client/Elvis Agent: When changes are made to a checked-out file while Elvis Pro and Elvis Agent are closed, these changes are not detected by Elvis Pro and Elvis Agent when they are opened again. LVS-12891 Pro client: Introduce webpack/typescript. LVS-12921 Collections: ZIP file has incorrect file name when downloading a Collection containing multiple files. LVS-12971 Pro client: Blank page shown when moving a file in fullscreen view and navigating to the previous file. LVS-12985 Pro client: Sorting order changes when returning to Home screen by clicking the Elvis logo. LVS-12993 Server: Add more detailed logging to the Filestore Rescue Tool. LVS-12999 Pro client: after checking-in a file in Content Station and renaming it at the same time, the old name is still shown in Elvis. LVS-13005 Pro client: Error page is shown when navigating to the Pro client from the Basket in the Brand Portal. LVS-13023 Shared Links: Add option to automatically finish the upload process. LVS-13028 Pro client: Banner and error page are shown when searching using an invalid character. LVS-13031 APIs: REST API - search does not return relation information for a Collection. LVS-13033 Server/permissions: Permissions cache is not invalidated cluster-wide on check-in, causing renames to fail. LVS-13036 Server: Increase Hazelcast no-heartbeat timeout to have a more resilient cluster. LVS-13038 Server: Incorrect message is shown when adding Enterprise Server URL in Management Console and cross-origin policy is not configured in Enterprise. LVS-13039 APIs: Unable to retrieve folder path when user is not a Super User. LVS-13058 Some EPS files get .dcs extension after downloading using Chrome. LVS-13076 APIs: RequestSecret returned by search API fails when serverPath is set with Elvis 6.23. LVS-13086 Pro client: Unable to move folder when target folder name is same as source folder name. LVS-13089 Pro client: Unable to add asset in Collection using "Add to pinned Collection". No known issues exist for this release of Elvis. The top section shows a reference to the entered search term. It can be clicked to search on that term (similar to pressing Enter). The bottom section shows a list of found folders which names contain the currently entered search term. A folder can be clicked to show its content in the search results. LVS-12797 Pro client: When exiting the extended view of the Linked panel, random search results are shown. LVS-12837 Pro client: Using arrow keys in Thumbnail view results in strange scrolling effects. LVS-12839 Pro client: inconsistent scrolling behavior when using the Page Down or Page Up key. LVS-12868 Stats index not properly created and updated across cluster on start of new month. LVS-12873 Pro client: Rename folder box remains in edit mode until renaming is done. LVS-12882 Pro client: When deleting an asset in Filmstrip view, the selection does not move to the next asset. LVS-12899 Pro client: Select All does not select all assets and shows incorrect number of selected assets. LVS-12907 Pro client: Moving file named '1.png' into another folder containing file named '1.PNG' silently fails. LVS-12909 Pro client: Unrelated metadata field groups show up in Metadata panel for different asset types. LVS-12914 Server side progress tracking may result in calculation errors when bulk processes are initialized. LVS-12928 After editing an image and saving it in.bmp format, the image is changed to .dib format in Elvis. LVS-12941 Pro client: Incorrect asset counter and selected label shown in Filmstrip view. LVS-12951 Pro client: Shared Links page not shown correctly after replacing an asset. LVS-12960 Brand portal: Collection is not opened when double-clicking it. LVS-12973 Update Exiftool to version 11.11. LVS-12978 Selecting an asset refreshes the page. LVS-12981 Pro client: When selecting a folder while deleting another folder, the confirmation message shows the name of the selected folder instead of the deleted folder. LVS-12984 Stop Exiftool processes on the system still running after node was restarted unexpectedly. LVS-12997 Support Tool times out and does not clean up logs in temp file store. LVS-13019 Pro client: Result grid does not scroll to top when switching between folders. LVS-13020 Pro client: When navigating assets in preview mode and reaching the last asset, the next batch of assets is not loaded. Brand Portal on Safari v10 is not working. All assets are loaded into view, causing the client to become unresponsive. Elvis InDesign client: support has been added for Adobe InDesign CC 2019. Pro client: Saving a related version of a checked-out file as a new file in Elvis. When a file is checked-out, other versions of that file are sometimes created, for example by duplicating the file in the folder in which it is saved or by using the application with which the file can be edited to save the file with a different name or as a different file type. Example: A file named flower.jpg is duplicated as flower-copy.jpg or saved as flower.png. During this process, the original file itself is not edited. The duplicate file is seen as a related file to the original file. It is now possible to directly save this related file to Elvis as a new file. For more information, see Opening files for editing (file check-out and check-in) using the Pro client of Elvis 6. Management Console: The Active Users page now also shows the client type that a user is using to connect to Elvis Server. LVS-11833 Pro client/checking-in: Add option to check-in a variation of an asset. LVS-12769 Management Console: client types are not shown on the Active Users page. LVS-12801 Pro client/previewing: When closing the preview for an asset, a black screen is briefly shown before the results appear. LVS-12803 Pro client/Shared Link/uploading: when selecting an asset in the Upload screen, the asset is not highlighted. LVS-12827 Upgrade Jetty to version 9.4.12. LVS-12833 Pro client/previewing: Arrow keys only work after clicking the preview image. LVS-12838 Pro client/metadata: After changing the list of metadata fields in thumbnail view results, all assets disappear from view. LVS-12854 Pro client: 'Application cannot be opened because it is not responding' error when checking-out more than 4 images. LVS-12857 Pro client: 'Cannot read property' error when moving an asset. LVS-12859 Migration: Take region parameter into account for S3 storage during migration from Elvis 4 to Elvis 6. LVS-12862 Shared Link: No more than 50 assets can be viewed in a Shared Link containing more than 50 assets. LVS-12872 Pro client/browse: 'Show files in subfolders' state is not kept after refresh or login. LVS-12875 Pro client: Assets end up in the parent directory when trying to move or copy an asset into a new folder. LVS-12885 Pro client: Checked-out files that are also placed on a checked-out layout are deleted from Elvis Checkouts folder when closing the layout in InDesign. LVS-12908 Pro client: Menus cannot be closed by clicking the same icon to open them. LVS-12913 Processing: unable to generate previews and thumbnails for Illustrator and InDesign files on Windows Server. LVS-12917 Pro client: Prevent check out and check in of InDesign files through the pro-client as this is handled by the InDesign client. LVSID-507 Add support for InDesign CC 2019. LVSID-513 Updating missing links does not update all links. LVSID-526 InDesign CC 2015 crashes when using 'Edit original'. Note: The installer that was shipped with the version of Elvis 6.22 on October 12 was replaced by a new installer on October 17 as part of a fix for issue LVS-1291 'Windows Server is unable to generate previews and thumbnails for Illustrator and InDesign files'. If you have downloaded the installer before October 17, please download the current version. No features have been added in this release of Elvis. Ghostscript. The version of Ghostscript that is used in Elvis Server has been upgraded to version 9.25 to apply fixes for vulnerability VU#332928. This vulnerability allowed attackers to execute arbitrary commands on the system. For more information see the WoodWing announcement as well as the article on cert.org. LVS-12619 Pro client/Elvis Agent: Elvis Agent fails to connect to Pro client with error 'This session has expired due to multiple concurrent logins'. LVS-12711 Brand portal/Basket: Basket icon incorrectly placed after page is refreshed. LVS-12726 Server/processing: Ghostscript vulnerability VU#332928 which may allow attacker to execute arbitrary commands on a vulnerable system. LVS-12729 server/installer: Elvis-shared-data has incorrect owner when using silent mode. LVS-12748 Pro client/uploading: Uploads is added to previously selected folder. LVS-12814 Pro client/versioning: Thumbnails missing for previous versions of asset containing spaces in file name. LVS-12828 Pro client/viewing: Incorrect text alignment in List view. LVS-12853 Pro client/renaming: Renaming folder splits destination into multiple folders and creates duplicate assets. LVS-12913 Processing: Windows Server is unable to generate previews and thumbnails for Illustrator and InDesign files. Pro client: Automatically finishing file uploads. When uploading files to Elvis using the Pro client, the last step of the process is to click Finish to return to the main screen. An 'Auto finish' option is now added that can be enabled to perform this step automatically. This is especially useful when the process of uploading files takes a long time, for example when uploading a large number of files and / or uploading files of a large size. Pro client: scrolling behavior. The scrolling mechanism for the Thumbnail view, List view, and Filmstrip view has been improved by only rendering those assets that are visible on screen. This speeds up the process of scrolling through assets. LVS-12211 Pro client/previewing: Error while using shortcut key 'F' in Full Preview mode. LVS-12462 Pro client/uploading: Unable to rename an asset on the Upload page while the Rename permission is assigned. LVS-12598 Server/Collections: Collection assetFileModified field is not updated after modifying the assets in the Collections. LVS-12671 Pro client/checking-in: The Save option is disabled when the folder dialog opens for Save as New. LVS-12699 Server/logging: Downloading logs over S3 for multiple nodes leads to missing log files with duplicated names. LVS-12714 Brand portal/Basket: The Share and Remove options are still available after clearing all assets from the Basket. LVS-12733 Processing/previewing: Default preview background color overwrites transparency for PNG and TIFF previews. LVS-12738 Server/single-sign-on: Node with single-sign-on (SSO) enabled does not start. LVS-12742 Pro client/thumbnail: Highlighted text is not shown correctly after search and delete. LVS-12752 Pro client/uploading: Incorrect upload counter is shown. LVS-12753 Pro client/checking-out: Check-out panel displays assets checked-out by other users. LVS-12738 Node with SSO enabled does not start. No new features have been introduced in this release of Elvis. Enterprise Server integration: Enterprise Servers page in Management Console. Changes have been made to the working of the Enterprise Servers page, used for creating a trusted connection with Enterprise Server 10.5 and higher. When a client ID and password have been generated using the Enterprise Servers page of Elvis 6.19, a new client ID and password need to be generated using the Enterprise Servers page of Elvis 6.20 or higher. The configuration file also need to be updated with this new ID and password. See Integrating Elvis 6 in Enterprise Server 10.5 or higher. LVS-11148 Pro client/metadata: Asset flags shown as 'flagIconWhenNotEmpty' instead of specific predefined value flag icon. LVS-12472 Pro client/metadata: Remove several metadata fields from selection list for which the user has no view permissions. LVS-12557 Server/plug-in: Job runner at times have the in-memory scheduled plug-in configuration removed, resulting in exceptions. LVS-12607 Server/stats: Enable ROLE_STATS required by the stats plug-in sample. LVS-12609 Plug-in/ww_enterprise_import: Prevent version conflict when running Enterprise import plug-in. LVS-12613 Management Console: Unable to specify user type in internal-user.properties.txt file. LVS-12641 Preview/EPS: Incorrect color conversion for CMYK EPS file previews. LVS-12654 Brand portal/Basket: After removing an asset from the Basket page, icons below the thumbnail for the next asset stop working. LVS-12687 Management console/Enterprise: Details are hidden when adding a new Enterprise server. LVS-12689 Server/Webhooks: Disable Webhook while index update is running. LVS-12690 Share client/uploading: Unable to upload assets in shared Collection. LVS-12691 Processing/SVG: Background color for SVG file not respecting defaultBackground setting. LVS-12692 Migration: When migration progress is interrupted during import, the last batch of files is not logged. LVS-12696 Migration: Do not migrate Desktop Client profiles to Elvis 6. LVS-12705 Pro client/plug-in: Sandbox / cross-origin violations block plug-in from working. LVS-12707 Migration: Multi-volumes are not handled correctly when migrating from Windows to another Windows environment. LVS-12720 Pro client/Elvis Agent: Pro client sends unnecessary metadata over stomp port to Elvis Agent. LVS-12725 After upgrading Elvis server, existing Enterprise Server cannot access Elvis anymore with old ELVIS_CLIENT_SECRET key. No changes to the documentation have been made this release of Elvis. Enterprise Server integration: Enterprise Servers page in Management Console. 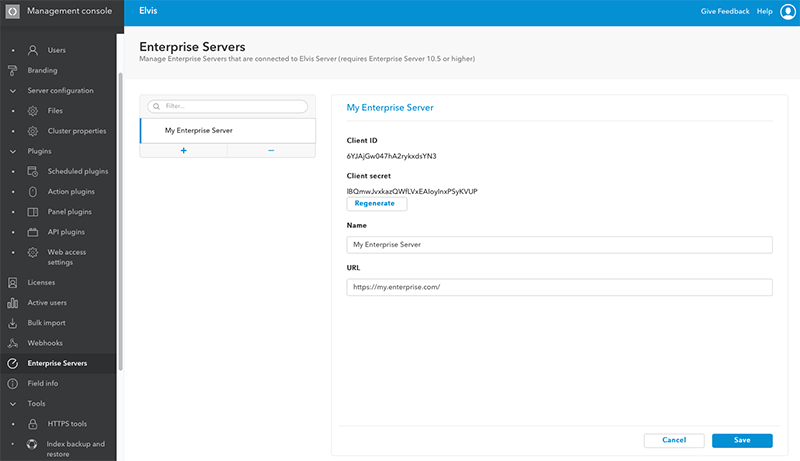 In preparation for upcoming improvements in the integration of Enterprise Server in Elvis, a new page named 'Enterprise Servers' has been added to the Management Console. This page will become functional when Enterprise Server 10.5.0 is released. LVS-10553 Processing/Downloading As: images are upscaled to higher resolutions than original. LVS-11420 Management Console: admin user session is shown more than once on Active Users page. LVS-12492 Processing/InDesign: layout previews are sometimes not generated. LVS-12510 Error when copying an asset using Copy To without selecting a folder. LVS-12531 Error when moving asset. LVS-12538 Unexpected results when entering a search term in the Search box but not performing a search. LVS-12543 Unable to edit a custom asset info file on Linux server for a user with read/write permissions. LVS-12554 Request Upload window: a Shared Link is created each time the Share button is clicked. LVS-12560 No thumbnail is generated for Collections and audio files. LVS-12587 Sharing assets: not able to set a folder for the Upload option. LVS-12597 Enterprise import plug-in stops working after some time. LVS-12602 Enable oAuthAuthorizationServerEnabled by default. LVS-12639 Metadata in thumbnail is not updated when sorting assets in thumbnail view. LVS-12646 Upload/download progress icon is incorrect. LVS-12656 Collections: Display issues when number of assets in Collection is equal to or greater than position of Collection in folder. LVS-12668 Checked-out files page: file is not removed from the page after replacing it with another file. The process for creating or restoring a backup of the index involved a manual process in which commands needed to be entered in the terminal. 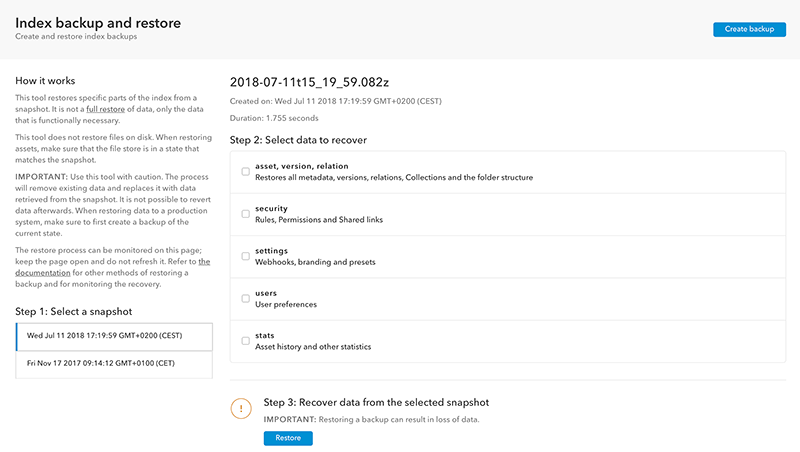 To make this process more user friendly, a new page has been added to the Management Console from which these processes can be easily run: the 'Index backup and restore' page. Creating a backup is now done by clicking the 'Create backup' button in the top right corner of the page. Restoring one or more specific indices is now done by following the steps that are outlined on the page. The default background color for thumbnails and previews of transparent images is white. If the subject of the image is also (mostly) white, this can make it hard to distinguish the subject from the background. In the Preview API, by setting the 'background' property. The following changes have been made for this release of Elvis. Controlling user access to Pro client features: renamed option for disabling the creation of User zone folder. The User zone Capability grants users access to a private user folder to which they have full access. For more information, see Controlling user access to clients and client features in Elvis 6. Capabilities: The ROLE_AIR_CLIENT Capability has been made obsolete. This Capability was used to allow users access to the Desktop client. Because the Desktop client was fully replaced by the Pro client in Elvis 6, the ROLE_AIR_CLIENT Capability has now been made obsolete. It has been replaced by the ROLE_WEB_CLIENT Capability. Note: If your plug-in configuration makes use of the the ROLE_AIR_CLIENT Capability (such as the Web access plug-in), replace it with the ROLE_WEB_CLIENT Capability. 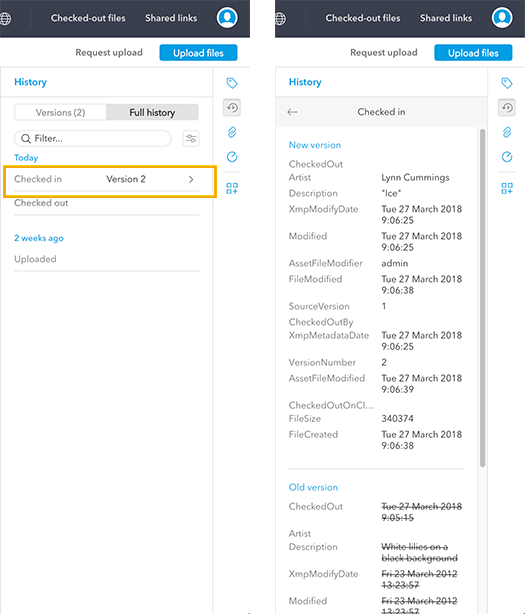 Webhook API: The asset_create Webhook event is now fired when the user confirms the upload by clicking the Finish button instead of after the creation of an asset. LVS-11841 Management console/backing up-restoring: Add ability to create and restore index backups. LVS-11964 Pro client/user zone: User Zone feature does not properly disable user's access to a user folder. LVS-12218 Configuration/previewing: Allow configuration of default preview background and custom preview background color. LVS-12236 Pro client/metadata: Show complete description in view only mode of Metadata panel to allow copying text. LVS-12294 Pro client/searching: Folder browser visible after copying with Search Preset active. LVS-12338 Pro client/Collections: Several Collection actions visible when user does not have Collections Capability assigned. LVS-12358 Pro client/scrolling: Improve performance of scrolling through assets. LVS-12359 Pro client/previewing: Increase performance of previewing assets. LVS-12421 Pro client/previewing: Adobe Illustrator files show incorrect dimensions in preview mode and filmstrip mode. LVS-12451 Pro client/searching: Increase the size of the search input box to make use of all available space. LVS-12455 Pro client/checking-in: Replacing a checked-out file sometimes results in loss of metadata. LVS-12474 Webhooks/asset created: Send "Asset created" Webhook event when user clicks Finish button instead of at start of upload. LVS-12486 Pro client/Shared Links management: Filter on description as well as subject. LVS-12501 Pro client/plug-ins: The 'Open in new tab' view does not show the plug-ins in the context menu. LVS-12502 plug-in/ww_enterprise_import: Multiple Editions are linked to a PDF page that is used in a single Edition. LVS-12517 Upgrading/Enterprise relations: Enterprise relations cannot be rebuild because of empty Editions. LVS-12520 Pro client/metadata: Dropdown list for predefinedValues overlaps input field. LVS-12521 Unable to upload assets to Share Link or Upload Request. The version of Elvis Agent that is shipped with Elvis 6.17 or higher needs to be installed. For installation and configuration details, see Installing Elvis Agent. When using Elvis Agent for opening files for editing using the Pro client, the version of Elvis Agent that is installed can now be checked by choosing 'About Elvis Agent' in the menu. Pro client: improved performance of scrolling through assets. The performance of scrolling through a large set of assets has been improved;. It is now possible to continue scrolling while assets are being loaded. Pro client: editing metadata of a checked-out asset. Using the Pro client, it is now possible to edit the metadata of an asset that is checked-out by another user. When the checked-out asset is checked-in again, any changes to the metadata of the asset that were made by other users while the asset was checked-out are kept; any changes to the metadata of the asset that were made by the user who checked-out the asset are lost. Elvis Agent: upgrade required. When using Elvis Agent for opening files for editing using the Pro client, the version of Elvis Agent that was installed in Elvis 6.16 or earlier needs to be replaced with the version of Elvis Agent that is shipped with Elvis 6.17 or later. This is because of various changes that have been implemented in Elvis Server, including in the area of security. APIs now consistently return only visible metadata fields. The Elvis APIs now consistently return only visible metadata fields. This was already the case for most APIs, but some did not correctly follow this behavior. This has now been corrected. LVS-12431 Pro client/upload: Placeholder is created while upload is in progress. LVS-12345 Elvis agent/communication: Send only requestSecret as part of query parameters from Elvis Agent to the server. LVS-12357 Server/API: Provide correct cache headers in API responses for Web browsers. LVS-12363 Configuration/Shared Link: Make default expiry date configurable. LVS-12364 Processing/PDF: Sometimes incorrect dimensions are applied to PDF renditions. LVS-12338 Pro client/Collections: Several Collection actions are visible while the user does not have the Collections Capability assigned. LVS-12380 Server/removing: Increase performance of asset and folder removal. LVS-12384 Pro client/Permissions: Copy and Move buttons are enabled on restricted folders. LVS-12385 Processing/EPS: Custom download of EPS files generates renditions with incorrect dimensions. LVS-12386 Server/login: When the serverPath configuration option is set, logging-in fails when the session is already authenticated. LVS-12394 Enterprise/export: Exporting an asset to Enterprise sometimes fails at the first attempt. LVS-12409 Migration Tool/exporting: Export from Elvis 4 fails to gather all folder locations from volume-config.xml. LVS-12436 Processing/XML: Parts of text missing from WCML preview. LVS-12446 Server/API: Ensure all APIs return only visible fields in metadata. LVS-12412 Pro client/metadata: Allow edit of metadata while asset is checked-out. LVS-12499 Pro client/scrolling: Improve performance of scrolling assets by rendering tiles before thumbnail and data is loaded form the server. S3 storage: Updated configuration. The S3 storage engine configuration has been changed: the setting named storage.engine.s3.endpoint has been replaced by a simpler setting named storage.engine.s3.region. Note: If you have one or more S3 storage engines configured, Elvis Server will not start until you replace the endpoint property with the region property. Config properties. 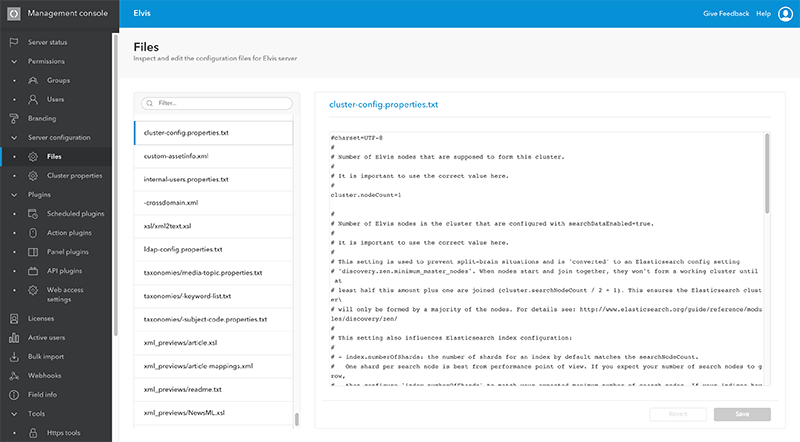 This page is available under 'Server configuration' and is split in two separate pages: the 'Files' page shows all currently configured settings of all configuration files, while the 'Cluster properties' page allows you to view and configure properties of the cluster-config.properties.txt file. See Changing the Elvis 6 Server configuration for a running cluster. Support tools. This page can be found under 'Tools'. See Gathering Elvis 6 Server information for troubleshooting. HTTPS tools. This page can be found under 'Tools'. See Setting up HTTPS in Elvis 6 Server. Enterprise update. This page can be found under 'Tools'. 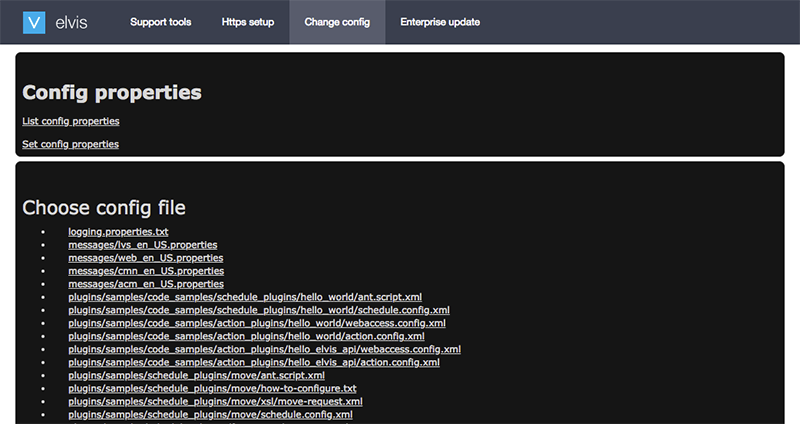 See Updating all Enterprise objects which are linked to Elvis 6. When accessing the Admin pages, you are automatically redirected to the Management Console. Renaming assets or folders by changing upper case or lower case. It is now possible to change the case of asset and folder names without having to rename them through an intermediate step. Management Console: Changes to the metadata field permission setup. In previous versions of the metadata field setup in the Management Console it was possible to assign fields to users that were either marked as technical or editable. This has now changed. As a result, check boxes or whole entries may appear missing from the page that were previously visible. LVS-8599 Storage/configuration: Update the configuration settings for the S3 storage engine. LVS-11667 Permissions/Collections: Unable to add asset to Collection if user has no edit metadata permissions. LVS-11914 Metadata/rename: Repeated renaming attempts cause auto-rename number to increase incorrectly. LVS-12254 Server/rename: Changing case of an asset or folder without changing its name. LVS-12256 Processing/AI: Distorted previews created from Adobe Illustrator files. LVS-12261 Plug-in/ww_enterprise_import: Multiple Editions of layout pages are not properly archived. LVS-12288 Management Console/Permissions: Technical fields are visible, non-editable fields are allowed to be set to editable. LVS-12310 Pro client/upload: Pro user cannot change image file name while uploading. LVS-12320 Management Console/licensing: License page serial and contact details are applied from previous license activation. LVS-12327 Previewing/processing: Incorrect preview generation for PSD images containing transparency. LVS-12329 Plug-in/upload portal: Upload portal Dam Tube is not working when serverPath is configured. LVS-12331 Pro client/upload: Unknown error when uploading a file to a zone for which the user does have create rights for. LVS-12355 Server/licensing: Unable to log in as super user when all seats are taken. No changes have been made for this release of Elvis. LVS-11343 Plug-in: Elvis API samples > Upload portal Dam tube is not working. LVS-12186 Pro client/download: Downloading a set of files containing a 4GB or larger asset will download as a TAR.GZ file instead of a ZIP file on MacOS. LVS-12195 Pro client/searching: Unexpected results shown when searching in a folder that contains a dash in the name. LVS-12212 Pro client/sharing: Share Links are not correctly sorted. LVS-12239 Storage/multi-volume: Errors appear in the log when moving an asset from a shared storage location to S3. LVS-12252 Pro client: The number of dragged items is not displayed correctly. LVS-12260 Processing/PSD: Some PSD files get corrupted after embedding the Elvis ID. LVS-12269 Admin/HTTPS: Importing a certificate fails when parsing an obfuscated password in the command line keytool. LVS-12308 Processing/metadata: Some images extract incorrect dimensions from the metadata. No changes to the documentation have been made for this release of Elvis. Pro client: more keyboard shortcuts added. To ease the use of the Pro client, many keyboard shortcuts have been added. For a full overview, see Keyboard shortcuts for the Pro client. Keyboard shortcuts are also shown in the context menu of a file in the Pro client. Implemented solution for possible data loss when removing assets. When Elvis Server is set up with shared or local storage engines, it is possible that removing one asset will result in the removal of original files of another asset. Each time an asset is removed, a very small chance exists of this bug occurring. This depends on the number of assets and the number of storage engines used: number of assets / 1,000,000,000 / number of storage engines. Large data sets on a single storage engine are more likely to be affected than large data sets on multiple storage engines. The result of this action would be an index entry where the download of an original file fails, but thumbnail and previews are still available. This issue has been fixed in Elvis 6.14. For more information or concerns, please contact support. Admin pages. 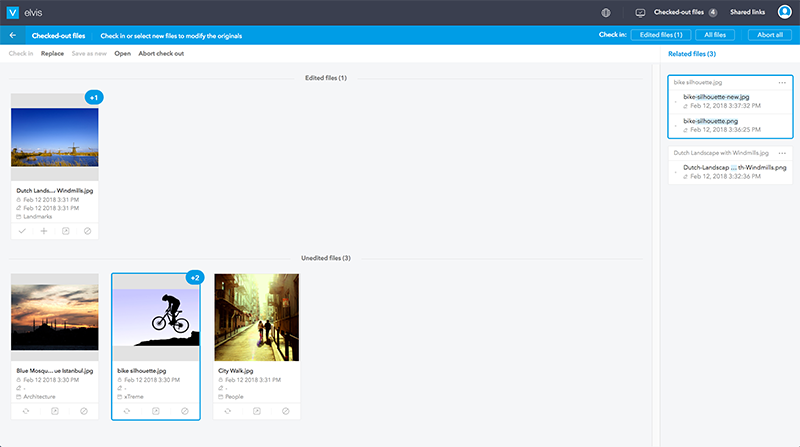 The styling and location of the navigation for the Admin pages has changed. Note: Most admin tools can be found in the Management Console or are planned to be moved there over the next few releases. LVS-12095 Pro client/plug-in: Fix Getty Images and iStockPhoto plug-in samples to work by opening a new tab. LVS-12117 Management console: Improve performance and reliability of Permission setups when switching between groups. LVS-12148 Brand portal/navigation: Multiple selection is not applied as OR within a taxonomy. LVS-12157 Processing/extracting metadata: Elvis takes IFD2 metadata when IFD0 exists and is correct, causing small image previews. LVS-12166 Pro client: Add keyboard shortcuts for various actions. LVS-12173 Plug-ins: Plug-ins stop executing due to server-side locks when allowParallelExecution is set to false. LVS-12175 Server/import: Extension/type mismatch creates unusable asset in Elvis. LVS-12188 Processing: Elvis adds JPG extension to FreeHand FH11 files. LVS-12190 API/download: Download original controller throws StringIndexOutOfBoundsException if asset ID or assetPath is not specified. LVS-12228 Server/stability: Data loss possible when files from 2 assets end up in the same folder on storage level and either asset is removed. LVSID-497 Elvis InDesign installer changes permissions of InDesign application folder. Knowing which changes were made to a file, when they were made and by whom they were made is an important aspect of managing files in Elvis. Any changes to the metadata that are made for a file as well as the actions that are performed on a file can now be viewed in the Full History tab of the History panel (this panel was named Versions panel in previous verions). Changes and actions are ordered by the time period in which they were made (today, yesterday, 2 weeks ago, and so on). Shown is the name of the action or the metadata field that is changed together with the value that it is changed to. When a file is checked-in, the number of the created file version is shown and the item can be clicked to view all metadata changes that have occurred. Figure: Clicking Checked-in for a file (lefts) shows the metadata values that have changed (right). The Search box and/or Filter at the top of the panel can be used to narrow down the number of items that are shown in the Full History tab. For more information, see Working with file versions and file history in the Pro client. Part of setting up a user or user group is setting the permissions for controlling access to clients and client features, folders and assets, metadata fields, Download Presets and Search Presets. 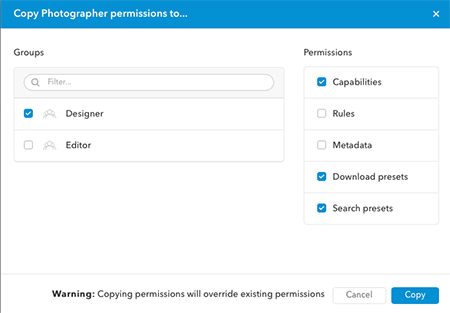 To make this process more efficient, a set of Permissions can now be copied from an existing user or user group. This is done by selecting a user or user group in the Management Console, clicking the new Copy button, choosing the user or group to which the permissions need to be copied, defining which type of Permissions should be copied, and then to run the process. Figure: The new Copy button that has been added. Figure: The Copy To window for choosing the user or group from which to copy the Permissions, and for defining which Permissions should be copied. Searching: Searching for users now works on both the display name and the log-in name, thereby increasing the chances of finding the user or group that is searched for. Management Console: The Management Console now uses the LDAP display name of a user or user group. Note: One exception exists: when setting up a Rule for controlling user access to folders and assets, the names for users and groups that appear in the New Rule or Edit Rule window are the technical names. Filtering on these names needs to be done by using these technical names. Pro client: The 'Version' panel has been renamed to 'History' panel. For more information about using this panel, see Working with file versions and file history in the Pro client of Elvis 6. Elvis Agent: change in configuration. In order for the Elvis Agent to be able to communicate with Elvis Server, a setting needs to be configured in Elvis Server. From Elvis 6.13, this is now done by using the webSocketEnabled setting instead of the stompPort setting used in earlier versions. For more information, see Opening files for editing (file check-out and check-in) using the Pro client of Elvis 6 - configuration. LVS-11882 Management Console/Permissions: Make it possible to copy Permission settings between users and groups. LVS-11963 Preview/custom: PPI setting is ignored when also embedding the color profile. LVS-12016 Processing/embed: Elvis ID is not embedded into Adobe Illustrator files. LVS-12030 Client/upload: 'Finish' button is available before system has completed its tasks, causing assets to be hidden after upload. LVS-12038 Pro client: Version panel only shows up to 5 versions instead of the actual number of versions in the system. LVS-12046 Pro client/download: Add warning when file of more than 4GB is downloaded using Pro client or Share client on Mac. LVS-12050 i18n/pt: 'October' not correctly translated for Portuguese. LVS-12064 Migraton/permissions: Mixed permissions in dump folder after index dump has been created. LVS-12074 Elvis Agent: icon is not very visible in Windows taskbar. LVS-12075 Management Console/Permissions: Improved search of LDAP user names in the users and groups section. LVS-12120 Processing/EPS: Thumbnails and previews of EPS files created with incorrect resolution. LVS-12122 Pro client/filter: Filtering by selecting a tag is not working correctly. LVS-12149 Elvis Agent/connect: Remove error message that appears when Elvis Agent is unable to connect. Working on assets in Elvis starts by searching for these assets. Some assets are searched for on a regular basis, such as those in a particular location, with a particular status, and so on. The search criteria for finding these assets can be made available by the system administrator in the form of a Search Preset. These appear in a list in front of the Search box. This way, users can quickly access the assets by choosing the preset instead of having to enter or be aware of the search criteria themselves. Figure: Choosing a Search Preset in the Pro client. 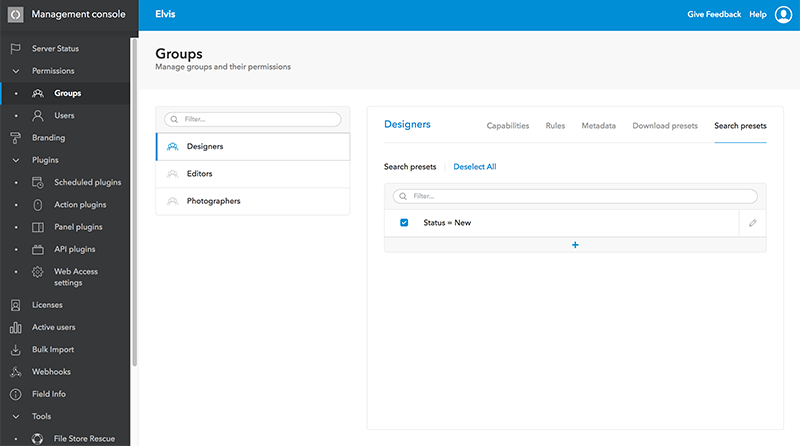 Search Presets are assigned to user groups and are created and managed on the Permissions > Groups page of the Management console. To make the process of previewing and comparing files easier, the preview can now be run in a separate window. This is done by clicking the New Window icon in the preview screen. The preview in this window remains static until the preview for one or more other assets is opened. This makes it possible to work on assets in Elvis in one window while previewing one or more assets in another window. For more information, see Previewing and comparing files in the Pro Client of Elvis 6. The Elvis InDesign client now also supports Adobe CC 2018. Server Status page has moved to Management console. The Server Status page has moved from the Admin pages in Elvis Server to the Management Console. For more information, see Monitoring the state of Elvis 6 Server. Field info page. The Field info page (which describes the technical information for the default metadata fields that are used in Elvis) has moved from the Admin pages in Elvis Server to the Management Console. The order of the field groups has also been changed to match the order in which they appear in other places of the Management Console and in the Pro Client. Shared Links: pagination added. Shared links are now displayed in pages of maximum 100 links. When this option is not defined, the user will be assigned the lowest possible user type as licensed. LVS-11881 Pro client/metadata flags: Flags are in reverse order compared to Desktop client. LVS-11911 Pro client/Share Link: Add paging and improved search on the Shared links page. LVS-11943 Brand portal/navigate: Selecting multiple values from the Categories panel returns empty search results. LVS-11957 Server/license: Users with no access granted take up a client seat after logging in. LVS-11969 API/create: Asset creation failed due to multiple parameter definitions for the same field. LVS-11975 plug-in/ww_enterprise_import: Import failed when placing the same image multiple times across Editions. LVS-11997 Migration/dump: Migration skips over entries or fails when maximum dump file limit is exceeded. LVS-11998 Metadata/extract: Asset fails to upload if it contains empty embedded metadata fields. LVS-12031 Metadata/extract: Embedded date containing time zone difference is not extracted. LVS-12055 Elvis Agent/connect: Use user name instead of full user name for LDAP users to prevent mismatching names in communication. LVS-12072 Admin: Remove tools and pages from old Admin page that are now available through the Management console. LVSID-466 Image is downloaded each time it is placed. LVSID-468 Links are not resolved or updated when a layout is checked-out and updated. LVSID-469 Elvis InDesign users are logged out while exporting PDF from large layouts. LVSID-482 No links to EPS shown on archived, reprinted and re-archived layout. Migration from Elvis 4: For information a -bout migrating Elvis 4 to Elvis 6, see Migrating Elvis 4 to Elvis 6. A new application is introduced named Elvis Agent: a small application that runs in the background on the same system on which the Pro client is used. With Elvis Agent, a file can be automatically opened in its native application and checked-in again to Elvis in a single action. Note: In order for Elvis Agent to be fully functional, Elvis Server needs to be configured. For more details, see Opening files for editing (file check-out and check-in) using the Pro client of Elvis 6 - configuration. Unedited files. When a file has been checked-out, it will initially appear as an 'unedited file'. This indicates that no changes have been made to this original file. Edited files. When the file is edited and saved using the original file type and file name, it appears as an 'edited file'. Example: A file named flower.jpg is edited and saved as flower.jpg. Related files. When a file is edited and saved using a different file type or file name, it is seen as a version that is related to the file that was originally checked out. Example: A file named flower.jpg is edited and saved as flower.png. These files appear in the 'Related files' panel on the right side of the page. Figure: The Checked-out Files page now shows files as 'edited', 'unedited', or 'related'. An edited file can now also be saved to Elvis as a new file. Admin pages: The 'Manual upgrades page' has been renamed from 'Upgrade cluster/nodes' and moved from the Admin pages of Elvis Server to the Management console. For more information, see Managing Elvis 6 Server. Searchable custom stats metadata. The Elvis stats index can be used to store custom stats records through the logUsage API. These stats records can also contain custom metadata. In Elvis versions prior to Elvis 6.11, this metadata is just stored, but not searchable. Searching and especially aggregating (reporting) on this data can be very useful when you want to perform reporting on data stored in the stats index. With Elvis 6.11, the indexing behavior has changed to ensure that the data is properly indexed and therefore searchable. For more information, see Searchable custom stats metadata. SPA-1054 Easy editing of files. SPA-1477 Port Manual Upgrade page to Management Console. LVS-8873 Metadata/PDF: Add configuration option to prevent calculating dimensions for PDF. LVS-11854 Download/ZIP: Prevent issue on Mac when opening large ZIP files. LVS-11877 Migration/export: Allow Migration tool to continue asset dump on unexpected exceptions. LVS-11886 Pro client/operation: Copy and Move fails when the asset path contains a comma. LVS-11906 Server/license: Not able to log in with an admin user when all licenses are in use. LVS-11995 Admin/permissions: Do not automatically add a space after selecting field in the query builder. LVS-11958 i18n/translation: Add new translations for added features. LVS-11962 API/stats: Make custom fields in stats index searchable. The Support tool is now able to download log files for plug-ins. When downloading log files from the server using the Support Tool page, the plug-in logs are now also included to make troubleshooting easier. Validation of configuration files. When changing XML files or other configuration files through the admin page, additional validation checks are now made before committing the change. This should prevent incorrect configuration from entering the server during runtime. By default, all these metadata fields are taken into account when creating relations between assets. The original configuration property autoCreateRelatedRelationsFromDerived will still be respected to turn all thses fields off simultaneously. LVS-11244 Pro client/select: Scroll to selected assets if they are off screen when opening the metadata or filter panels. LVS-11270 Brand portal/filter: Not all relevant values are displayed in the tags filter. LVS-11433 Admin/support tools: Download of log files now include logs from plug-ins. LVS-11466 Pro client/version: Show dates in the Version panel in the selected locale and include year in the value. LVS-11486 Pro client/user interface: Width of list in panel does not change when size of localized messages increases. LVS-11547 Server/config: Add configuration for automatically created derived relations to differentiate between instanceId, documentId and originalDocumentId. LVS-11780 Plug-in/ww_enterprise_import: Remove 'Archived' from configuration of the plug-in, as it has no purpose. LVS-11805 sSrver/metadata: Checksum fields are not set when a placeholder asset is updated with actual data. LVS-11816 Pro client/search: Filtering on file name does not work when the name contains a space. LVS-11820 Plug-in/ww-enterprise: Handle extension differences like TIF/TIFF and JPG/JPEG while archiving a layout by following Enterprise. LVS-11827 iPad/share: Non-functionial Copy button is shown when sharing asset or requesting upload. LVS-11829 Pro client/iPad: Change positioning, size and visibility of several UI elements that were rendered out of view. LVS-11830 Pro client/localization: Translated messages were not applied to the custom download pop-up. LVS-11840 Server/stats: Prevent situation where creating new stats index results in repeating warnings during change of month. LVS-11848 Admin/config: Validate input of asset-info and internal-user-properties before saving it server-side. LVS-11864 Share Link/upload: Upload of asset with existing name already exists results in unexpected check for role_version. LVS-11875 Server/HTTPS: Enable redirectHttpToHttps show HTTP ERROR: 500. LVS-11885 Pro client/plug-ins: plug-in context function updateCallback is called twice. Pro client: rotating and flipping images. Images can now be rotated and flipped directly from within the Pro client without having to open them in an external editor. Figure: Rotating an image in the Pro client. Note: For users to make use of this feature, 'Image manipulation' feature needs to be assigned to their Capability setup. Note: In case your instance of Elvis Server does not start because of custom configuration settings or because a plug-in makes use of one of the removed libraries, either use the default configuration or contact WoodWing support. The License page has been moved from the Admin pages section of Elvis Server to the Management Console. For more information about the Management Console, see Using the Management Console of Elvis 6. Pro client: new icon for Collections. The icon for the Collections panel has been changed to make it look less like the Version icon. LVS-6379 Server/move: Moving Collection assets without extension could lead to duplicate asset IDs in the index. LVS-9170 Server/operations: Bulk metadata update stops when error is raised. LVS-11349 Pro client/share: Sharing from Folder browser not possible. LVS-11560 Enterprise/integration: Asset with Enterprise unsupported characters cannot be dragged to Content Station. LVS-11603 Share/Download: Download a single file directly instead of packaging it in a .ZIP first. LVS-11699 Processing/Linux: Incorrect preview is generated for PSD CMYK with Alpha channel. LVS-11740 Pro client/checkout: Remove scroll bar on checked out assets on Checkout page. LVS-11751 Plugin/metadata_import: Unable to update file name. LVS-11788 Processing/EPS: Quality of EPS previews are below expectations in some cases. LVS-11811 Plug-in/context: Elvis context does not update after logging in again. LVS-11814 Processing/watermark: Watermarked thumbnails for CMYK images are not created by GraphicsMagic. LVS-11821 Pro client/messages: Day shift in French date translations. LVS-11822 Pro client/messages: French translation for log-in is incorrect. LVS-11772 Admin/license: Add License page to Management console. LVS-11810 Server/start: Improve boot time. LVS-11836 Pro client/use -interface: Update icon for Collections. LVS-11837 Pro client/user interface: Add 'busy' state to Sign In button. LVS-11834 Pro client/image orientation: Add image rotate and flip to Pro Client. 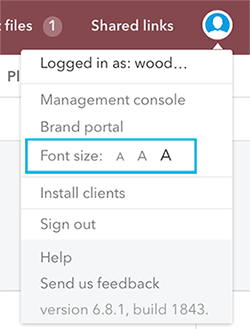 Users of the Pro client and the Brand portal can now slightly increase or decrease the font size of the text that is used in the application by using the options that have been added to the Avatar menu. Figure: The options in the Avatar menu for changing the font size of the text in the Pro client. To rebuild these relations, a new tool named the 'Enterprise relations upgrade' can be used. It is run from the Admin pages of Elvis Server. For more information, see Rebuilding Enterprise relations in Elvis 6 that were incorrectly set during migration. In rare cases it can be possible to have multiple assets with the same asset ID in the system. Because an asset ID should be unique for each asset, this issue needs to be resolved. This can now be done by moving duplicate assets to a dedicated folder and assigning a unique ID to each asset, or by removing the duplicate assets from the system. Note: The action of moving assets to a different folder and assigning unique IDs is not supported when the assets are stored on a S3 storage engine on Amazon AWS. For more information, see Cleaning up assets with the same ID in Elvis 6. Sorting assets in the Pro client: When browsing assets without entering a search term, all assets now typically have the same relevance score. As a result, sorting on 'relevance' is no longer possible; instead, a more logical field such as 'file name' should be used for sorting the assets. LVS-3851 Generate previews of XLSM files. LVS-11207 Share/dialog: Text in Share Link description field is not limited and therefore not visible. LVS-11346 Plug-in/stats: RAW Stats plug-in not showing older statistics. LVS-11375 Pro client/linked items: Close linked items search when browsing folders. LVS-11517 Server/license: Maximum API licenses reached while only one API user active. LVS-11546 Enterprise/integration: Fix possible Null Pointer Exception when updating Enterprise relations without placement. LVS-11574 Client/pro: Load more assets initially when viewing search results on larger screens. LVS-11627 Pro client/scroll: Increase performance of rendering assets on screen. LVS-11654 Admin/tool: Add cleanup tool for assets with duplicate assetIds. LVS-11662 Enterprise/integration: Drag-and-drop from Pro client to Content Station depends on InDesign Client capability granted. LVS-11669 Metadata/copy: When copying, prevent several technical fields from being copied to assets. LVS-11679 Admin/upgrade: Add Enterprise Relations upgrade to admin page. LVS-11688 Preview/XMP: Previews are not generated for file types containing much XMP metadata. LVS-11725 Pro client/search: Change default sort on search results without query or filter. Share links with a custom serverPath are not working correctly. The download files for Elvis 6.8.1 can be found in the Release announcement. API plug-ins. API plug-ins make it possible to route API requests through Elvis Server instead of directly to an API of an external service, thereby making it possible to use the security and authentication features of Elvis Server. A cross-origin request is required as your shop API is hosted on a different domain. This can lead to security issues as cross-origin requests are often blocked. Authentication needs to be set up to ensure that your Elvis users can access the external API. We resolve both by running the API requests through Elvis. Cross-origin requests are now no longer required as the client only communicates with Elvis Server, not the Shop API. As for authentication: the API plug-in contains support for Elvis Capabilities, allowing you to for example configure the plug-in in such a way that only users who are logged in to Elvis are given access to the external API. Metadata: allow customizations of compass or analyzer settings of existing fields. It is now possible to change compass and analyzer settings of default metadata fields. This makes it possible to customize more existing fields, thereby reducing the need for creating custom fields. Note: Changing these compass settings requires to restart and re-analyze the index. For more information, see Changing the default metadata field options in Elvis 6 Server. LVS-11364 Management Console/Asset Processing-tool: Browser freezes when thread count is emptied. LVS-11448 Server/performance: Increase speed of removing assets from the system. LVS-11496 Config/metadata: Allow customizations of compass/analyzer settings of existing fields. LVS-11554 Processing/previews: defaultImagePreview with custom value results in error in log: 'Could not retrieve preview'. LVS-11638 Brand protal/basket: Error banner and console error while navigating to Basket. LVS-11653 Migration/export: Elvis Migration shows it is finished before it is actually done. LVS-11672 Migration/metadata: sceRelations object is parsed incorrectly when migrating Elvis 4.6 to Elvis 5 or 6. LVS-10712 Plug-in/API: Introduce API plug-ins to add custom API services. LVS-11640 Pro client/linked items: Linked items panel freezes when many relations exist. LVS-11647 Configuration/analyzer: Add customization option in custom-assetinfo to alter compass settings. LVS-11691 Share/metadata: Copying a shared asset caused the copy to be shared too. No known issues exist for Elvis 6.7.1. The download files for Elvis 6.7.1 can be found in the Release announcement. 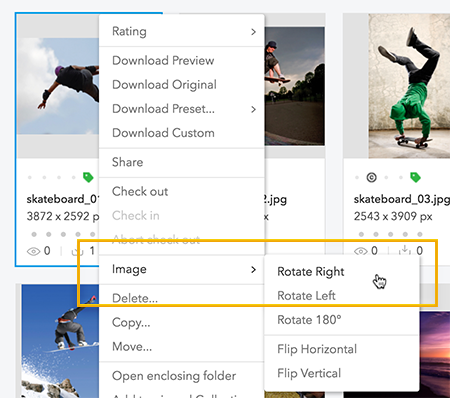 When needed, the thumbnail and preview of an asset can now be manually regenerated by right-clicking the asset in the Pro client and from the context menu choosing Regenerate thumbnail. Note: This feature used to be present in the Desktop client of Elvis 4 and Elvis 5 and has now been made available in Elvis 6. This command is only available in the context menu if the user has been given permission to use it. A new Capability is added named 'Regenerate thumbnail'. It allows a user to manually regenerate the thumbnail and preview of an asset. A user can do this by right-clicking the asset in the Pro client and from the context menu choosing Regenerate thumbnail in the Pro client. For more information about assigning Capabilities, see Controlling user access to clients and client features in Elvis 6. When searching for assets in the Pro client or Brand portal, or when viewing assets that are shared, the displayed assets can be sorted by using the Sort list. Figure: The Sort list in the Pro client. For information about how to configure these settings, see Customizing the list for sorting assets in the Pro Client, Brand portal and Share client in Elvis 6. These options can be found in the Elvis menu, context menu of a selected image and in the Links panel. For more information, see Using Elvis 6 with Adobe InDesign – Relinking placed files with (other) files in Elvis. Using Ctrl+A on Windows or Cmd+A on Mac OS X, a user can now select a maximum of 1000 assets in the Pro client or Brand portal. The shortcut can be used on the Search results pages of the Pro client and the Brand portal and when working with assets in Collections in the Pro client. For other pages where multiple assets are shown the shortcut has been left out because the page either already contains buttons for working with all assets (the Basket page in the Brand portal) or adding it has no functional benefit (such as the Shared Links page, the Checked-out files page and the page for uploading files). For more information about scripting, see Using Elvis 6 with Adobe InDesign – Scripting events. For information about relinking assets, see Using Elvis 6 with Adobe InDesign – Relinking placed files with (other) files in Elvis. Elvis InDesign client: improvement in the process of updating out-of-date images. In previous versions of the Elvis InDesign client, Elvis images for which a newer version existed than the one placed on the layout were automatically updated when the layout was opened or when the user chose Elvis > Update All. However, the user had no control over the process and last-minute changes to images were difficult to spot when working on the layout. For more information, see Using Elvis 6 with Adobe InDesign – Updating all Elvis files placed on a layout. LVSID-459 Show error message when placing an Elvis image with a very long file name on layout fails. LVS-9051 Pro client/flags: Configure up to 18 metadata flags to be shown for an asset. LVS-11504 Server/event: Add user that removed the asset to Event API assetRemove metadata as 'deletedBy'. LVS-11566 Security/config: ContentSecurityPolicy frame-ancestors header contains domain names with apostrophes. LVS-11569 Pro client/select: Select up to 1000 assets in search results by using keyboard shortcut. LVS-11580 License/activation: Improve connect and time-out of Activation page to the Activation Server. LVS-11585 Pro client/copy: Copying Collection from browser to existing location overwrites existing. LVS-11591 Share/access: Share Links are not working when server is configured with custom serverPath. LVS-11596 Server/event: Reduce events sent by the server on Collection relation updates. LVS-11601 Pro client/thumbnail: Missing 'regenerate thumbnails' option when right-clicking asset. LVS-11603 Download/ZIP: Unpacking multiple large asset downloads fails. LVS-11606 Pro client/thumbnail: Add configuration properties to customize retry behavior when loading thumbnails. LVS-11610 Share/upload: Moving or deleting folder breaks upload request authkey. LVS-11616 Pro client/sort: Allow customization of sort options. No known issues exist for Elvis 6.6.1. The download files for Elvis 6.6.1 can be found in the Release announcement. No new features have been introduced in Elvis 6.5.1. No changes have been made in Elvis 6.5.1. LVS-11022 Pro client/import: Duplicated naming handled differently for creating and renaming files. LVS-11471 Pro client/metadata: Certain characters cannot be added to tags. LVS-11472 Import/CloudFront: Unable to upload large movie files. LVS-11473 Migration Tool/import: Copy/move operation fails for files containing umlauts in name. LVS-11475 Management Console/plug ins: Table style broken in plug-in pages. LVS-11506 Improve large metadata extract. LVS-11511 Processing/XMP: Incorrect processing of empty XMP history entries. LVS-11516 Security/Web: Conflicting X-Frame-Options header. LVS-11537 Migration Tool/versions: Migration tool not able to successfully migrate old versions with a different file extension. Share links that contain a custom serverPath are not working correctly. The download files for Elvis 6.5.1 can be found in the Release announcement. No documentation updates have been made for the release of Elvis 6.5.1. LVS-11556 Cluster/upgrade: Multi-node cluster fails to start up when upgrade takes longer than 1 minute. Note: If you have upgraded to Elvis 6.4.1 successfully then using the Quick Patch is not necessary. No new features have been introduced in Elvis 6.4.1. Video preview shows original video where possible: When previewing a video, the original video is now shown (in its original quality and duration), instead of a preview (in lower quality and limited in duration). This applies to videos in MP4 or MOV format and to videos with h264 encoding. LVS-10475 Allow playing original video instead of preview if format allows it. LVS-11304 Pro client: Dragging and dropping images from Elvis to InDesign is not possible for Pro and Standard users. LVS-11360 Panel plug-ins: Error when using Metadata Stamper Panel plug-in: "Unable to load messages, cause: 403 Forbidden". LVS-11427 Pro client/drag: ServerURL in dragFormat is set to two dots. LVS-11457 Security/plug-ins: Plug-ins are not working in Firefox and Safari. LVS-11474 Management Console/Webhook: Previously selected Webhook is not cleared by the Filter. LVS-11482 Pro client/thumbnail: Empty thumbnails are cached by the Web browser and not updated when the image is available. No known issues exist for Elvis 6.4.1. The download files for Elvis 6.4.1 can be found in the Release announcement. No documentation updates have been made for the release of Elvis 6.4.1. Security: using Secure Session cookies. Elvis Server can be now be configured to issue HTTPS-only session cookies by adding the 'Secure' directive to these cookies. For more information, see Elvis 6 security updates overview. No changes have been made in Elvis 6.3.1. LVS-11229 Folder/download: Downloading a folder containing a large number of assets is only partly downloaded. LVS-11241 Stats/download: Multiple asset downloads are not recorded in Elvis Stats. LVS-11328 Management Console/permissions: It is possible to store an incorrect rule. LVS-11357 Upload/client: Files with an excluded file type can still be uploaded. LVS-11369 Preview/processing: Incorrect preview generation for PSD images with multiple transparency layers. LVS-11377 Pro client/profile: User name not shown in Avatar menu of Pro Client and Brand Portal. LVS-11378 Preview/processing: Import of certain JPG images consumes all system memory. LVS-11384 Pro client/metadata: Metadata tooltip does not disappear when mouse pointer is no longer hovering over it. LVS-11385 Management Console/permissions: Incorrect tooltip for Watermark permission. LVS-11397 Taxonomies: Taxonomy Filters are not working correctly in the Pro client and Brand portal. LVS-11398 Server/index: Stats index is not created for new month. LVS-11401 Metadata/embed: Metadata embedding fails on fields with new lines. LVS-11407 Pro client/Shared Links: Subject and description disappear when changing zoom settings. LVS-11408 Metadata/extract: fNumber metadata not extracted for some assets. LVS-11409 Pro client/version: When replacing current file with a file of different type and using Download Original, file of incorrect type is downloaded. LVS-11437 Pro client/Safari: When editing folder name, text is shown as white text on white background. No known issues exist for Elvis 6.3.1. The download files for Elvis 6.3.1 can be found in the Release announcement. No new features have been introduced in Elvis 6.2.1. No changes have been made in Elvis 6.2.1. LVS-11227 Admin/status: 'In processing' counter includes already finished tasks. LVS-11241 Stats/download: Multiple asset downloads are not recorded. LVS-11272 Processing/PDF: Default resolution PPI is ignored for PDF previews. LVS-11297 Admin/Rescue tool: the Rescue tool fails for version assets without an index entry. LVS-11304 Pro client/drag: Pro and Standard users are not able to drag and drop Elvis images to InDesign. LVS-11318 Admin/Asset Processing tool: Asset Processing tool options are ignored. LVS-11338 Installer/Windows: Kill known processes that can block tool files upgrade. LVS-11340 Admin/users and groups: Random user is shown selected when opening the page. LVS-11359 Plug-in/authentication: Sample plug-ins log in using an unsupported GET method. No known issues exist for Elvis 6.2.1. The download files for Elvis 6.2.1 can be found in the Release announcement. In an effort to improve the security of Elvis Server, we have asked Pine Digital Security to perform an independent security test for us. During this test, the application is manually tested by an ethical hacker, supported by tools. One of the recommendations that resulted from the test was to make changes to the REST API. All data changing APIs now only accept POST requests and require a Cross-site request forgery (CSRF) token. More information about the changes can be found in Pine’s Third-Party Memo and WoodWing's clarification. These are available on request. 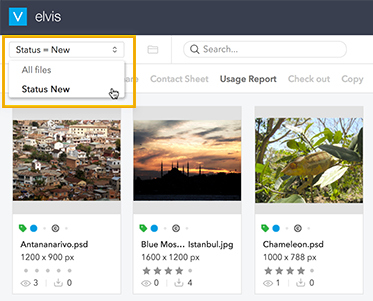 End users connect to Elvis by using the Pro client, the Brand portal, the Admin pages, the Management Console, or the InDesign client. This involves logging in to Elvis Server to get access to the stored assets. When single sign-on is implemented through the use of Active Directory Federation Services (ADFS), logging in to a client is done automatically for a user (with the exception of the InDesign client, for which single sign-on is not supported). A user logs in on a machine that is connected to the same domain as the ADFS that is configured in Elvis. Using Internet Explorer, the user accesses Elvis. Elvis Server redirects the user to ADFS. ADFS recognizes the user's Windows domain log-in. ADFS automatically redirects the user back to Elvis. The user is logged in to Elvis without ever seeing a log-in screen. For more information, see Implementing single sign-on in Elvis 6 Server. Custom functionality can be added to the Pro client in the form of a panel. Such a panel is added by adding a plug-in to Elvis Server. Figure: In this example, a panel is added showing product information for a selected asset, derived from an external PIM system. Figure: In this example, a panel is added containing options to quickly apply specific copyright metadata to selected assets. Licensing. Assigning a license to users or user groups now also determines which clients they have access to; it is not possible anymore to specify this separately. Example: users with a Standard license will automatically have access to the Pro client, Brand portal, and InDesign client. For more information, see Controlling user access to clients and client features in Elvis 6. Desktop AIR client removed. The Desktop client that was based on Adobe AIR technology has been made obsolete. Its features are now available in the Pro client (for end users to work with the available assets) and the Management Console (for system administrators for setting up and managing Elvis Server). Elvis Admin pages. Changing any of the configuration files through the use of the Elvis Server Admin pages can now only be done by clicking its link on the Change Config page and making the changes directly on the page. Updating a property by running a URL is not possible anymore. API Authchred.Authcred authentication does not support anymore the ability to modify data; only retrieving data (GET/OPTION/HEAD requests) such as downloading assets is supported. Integrations that want to modify data should use another form of authentication. Changes to REST APIs. Because of improved security measures in the REST API of Elvis 6, all data changing APIs only accept POST requests, not GET requests. Also, the POST request needs to include a cross-site request forgery (csrf) token. For more information, see Elvis 6 REST API - Performing a POST request with a csrf token. Automatically exporting assets from Elvis to Enterprise. The process of automatically exporting assets from Elvis to Enterprise is currently not possible. The tool that was available in the Desktop client of Elvis 5 is not yet available in Elvis 6. Note: Assets can of course still be moved from Elvis to Enterprise manually through drag and drop. Clean installation: For information about installing Elvis 6 Server on a system on which Elvis Server is not yet installed, see Installing Elvis 6 Server. The download files for Elvis 6.1.1 can be found in the Release announcement. Information about how to install, configure and use Elvis 6 can be found in the Elvis 6 section on the Help Center. Information about compatibility with Elvis 6 with other software can be found in the WoodWing Compatibility Matrix.